Simons ‘Really Awesome Coffee’ mobile coffee van can be seen in and around Northampton visiting local businesses supplying them with delicious espresso based drinks and deli-style lunch choices. Really Awesome Coffee Northampton also caters for events and functions and is available as mobile catering for hire. He offers an extensive menu of gourmet coffees, luxury hot chocolates and other café favourites and he has a popular range of speciality beverages that includes matcha green tea lattes, chai tea lattes and fresh fruit and vegetable smoothies. Everyone loves his iced coffees, frappes and freshly prepared milkshakes especially during summer and often can’t resist the temptation of his delicious cakes, pastries and other sweet treats. The van also boasts a hot-hold oven meaning he can offer hot food such as bacon rolls, pasties and the like and also a self-serve refrigerator which houses high-quality sandwiches, baguettes, salads etc. He also provides a selection of corporate platters for breakfast or lunch meetings and these can be organised for next-day delivery. 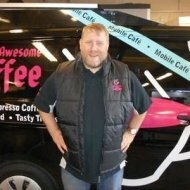 Simon is a fully trained barista and his Really Awesome Coffee van is also available for local events, functions and parties. So if you work at a local business and would like freshly ground gourmet coffees, hot & cold food, chilled drinks and tasty treats brought to you at your place of work then please get in touch to see how he can add something special to your day! Simon has full Public and Product Liability Insurance, Hygiene Inspection certification and is a fully certified member of the Nationwide Caterers Association.